A tiny new drone developed by the Naval Research Laboratory could be used to detect enemy submarines. The U.S. Naval Research Institute has developed a tiny new reconnaissance drone the size of a human hand designed to be dropped from aircraft at high altitudes or launched by firing it from a gun into the air. Like with previous inventions (see: “Drone Swarms: How the US Navy Plans to Fight Wars in 2016”), the scientists at the Naval Research Laboratory sought inspiration from nature when designing the U.S. military’s smallest unmanned aerial vehicle (UAV) to date, particularly how insects called Cicadas suddenly emerge in huge swarms from the underground for reproduction. Lacking an engine or other propulsion system and only consisting of about ten parts,this “micro air vehicle” is essentially a glider and “resembles a paper airplane with a circuit board,” AFP reported yesterday. And as with all swarmbots, the Close-In Covert Autonomous Disposable Aircraft (CICADA)’s principal strength lies in the large number of that can be deployed at a very low cost, perhaps as little as $250 apiece. 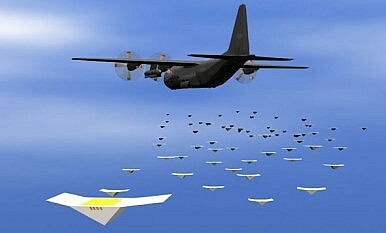 “The idea was why can’t we make UAVs that have the same sort of profile. We will put so many out there, it will be impossible for the enemy to pick them all up,”Aaron Kahn of the Naval Research Laboratory told AFP. The speed of the CICADA UAV is around 74 km (46 miles) per hour. “In a test about three years ago in Yuma, Arizona, Cicada drones were released from 57,600 feet (17,500 meters). The little drone flew — or fell — 11 miles, landing within 15 feet of its target,” AFP explained. “They are robotic carrier pigeons. You tell them where to go, and they will go there,” said Daniel Edwards, a scientist at the Naval Research Laboratory. Powered by lithium ion batteries and equipped with tiny imaging and networking sensors, the CICADA drone is designed to glide to programmed GPS coordinates and can be employed in a host of different tasks. The CICADA could be particularly useful for recording enemy troop movements. “You equip these with a microphone or a seismic detector, drop them on that road, and it will tell you ‘I heard a truck or a car travel along that road.’ You know how fast and which direction they’re traveling,” Kahn said. But the tiny UAV, outfitted with magnetic sensors and microphones, could also be used for signal intelligence missions and, for example, pick up enemy submarines. While the drones have not been deployed yet, the few prototypes that exist are remarkably robust. “You can thrown them out of a Cessna or a C-130 (…) They’ve flown through trees. They’ve hit asphalt runways. They have tumbled in gravel. They’ve had sand in them. They only thing that we found that killed them was desert shrubbery,” Daniel Edwards explained. 'Swarmbots' could mean a new era in autonomous warfare.